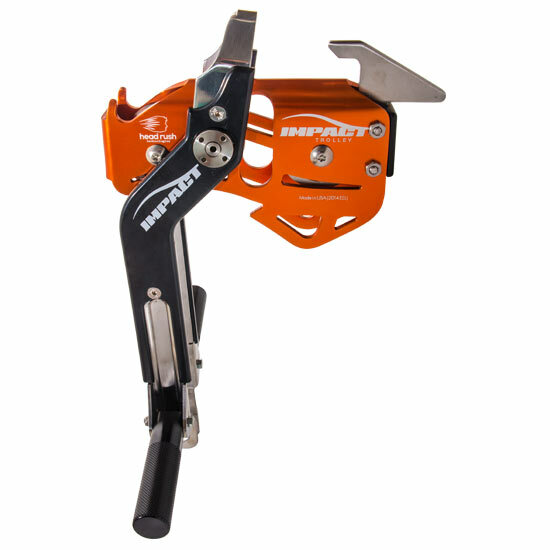 The Impact Trolley is the only trolley on the market designed specifically for impact braking in the recreational zip line and ropes course industry. Engineered specifically for the zipSTOP Zip Line Brake, the Impact Trolley provides smoother braking, enhanced rider experience, reduced cable wear, and decreased rider risk. Maximum operating speed is 75 mph (120 kph) and the suitable rider weight range is 33–330 lbs (15–150 kg). The Impact Trolley can be mounted in various configurations including single or dual cable setups with primary and secondary clip-in options, and with or without the T-Handle Accessory or Hook/Catch accessory mechanism.  See the headrushtech.com website for more details. This option combines all of the benefits of the Impact Trolley, Catch Accessory (to help eliminate rider retrieval scenarios) and T-Handle (with knurled handles for maximum grip and stainless steel construction) – all in one package. Our most popular trolley setup, with the best possible rider experience. The handle keeps riders facing forward with their hands free from the impact area (essential with impact braking) and pivots to smoothen the impact, swinging with the rider as they decelerate. The hook interacts with a catch mechanism on the brake trolley to prevent riders from rolling away from the landing zone, increasing throughput by allowing a guide to easily pull the rider to the platform. It even works with offset redirection lines. 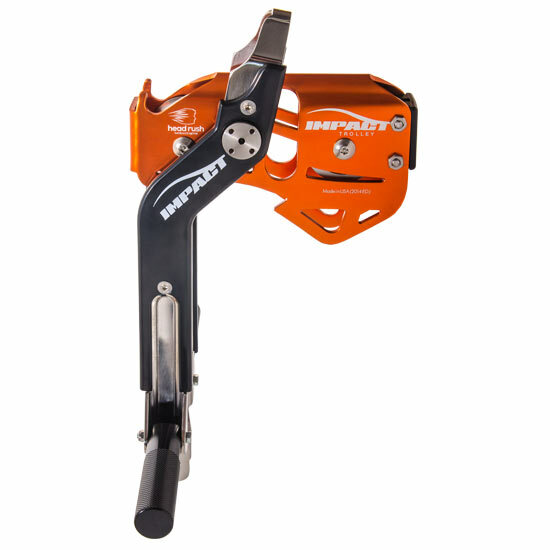 The Impact Trolley is the only zip line trolley designed specifically for impact braking. Its superior design and quality components make it the best of its class, and zip line operators can always add on features (catch accessory, T-handle, etc.) as their needs evolve.